This is one last reminder that tomorrow night we will host our second Parent Open House of the year from 6:30-8:30. This will give parents a chance to have brief meetings with teachers. Progress Reports will also be available at the office for parents who have not received them. Our Open House also marks the opening of our Annual Student Art Show. Hundreds of pieces of work will be shown. The exhibited work in “Exhibition 2011: Identity” comes from classes in Design, Photography, Ceramics, Graphic Design, Drawing & Painting, Digital Art, Web Design and Portfolio. 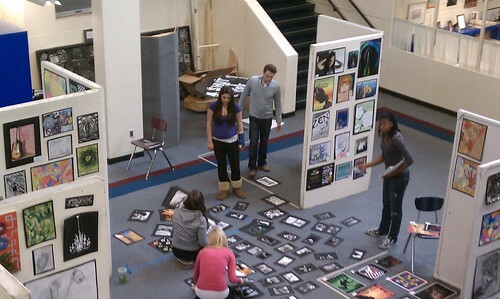 Our students have been working hard in preparation for our annual art show. Finally, I encourage you to arrive early and check out a preview of our 2011 Drama Production of Beauty and the Beast. The preview will take place at 6:30 in the auditorium. Some of the main characters did a commercial for the show today in the main lobby. Hope to see you all tomorrow evening!